Eclipse plugin that handle the derived state of resources from a textual file. AutoDeriv is an Eclipse plug-in that handle the 'derived' state of resources from a textual file in a similar way than .gitignore or svn ignore files work. readable, centralized, easy configuration. No mess in sight. The plug-in aims to make all this totally transparent for the end user. decorate label and icons to see derived resources at one glance. AutoDeriv is a classic Eclipse plugin, the installation process is also very classic. First, we need to add the update site location so that eclipse can found the plugin. Then, go to Help > Install new Software > Work with: and select this server. The plugin should now appear in the list below. Follow the usual install process. The plugin offers two levels of configuration. A per-project configuration, and a workspace configuration. The difference is just the configuration file emplacement: for each project you want to handle, create a new configuration file directly in the root folder. For a workspace-wide configuration, the .derived file should be located in the workspace root, or in the hidden .metadata folder (itself in the workspace root folder). comment a line (or a part of it) with a # symbol. src/include/version.h# this specific file is also generated. This will instantly set the folders ext and target and all its element (files, sub-folders,...) to be considered as derived. The folder target/keep will not be concerned thanks to the exclude rule starting with a ! character. In this example, the file version.h located in src/include will also be derived. This is nice for auto-generated files. There is also a regexp rule (the "*.dep" line) that will mark all the resources with an 'dep' extension as derived. The previous sample exposes the basics, it is enough for many applications. That being said, AutoDeriv wants to be more flexible. Here are some other rules that can be used. 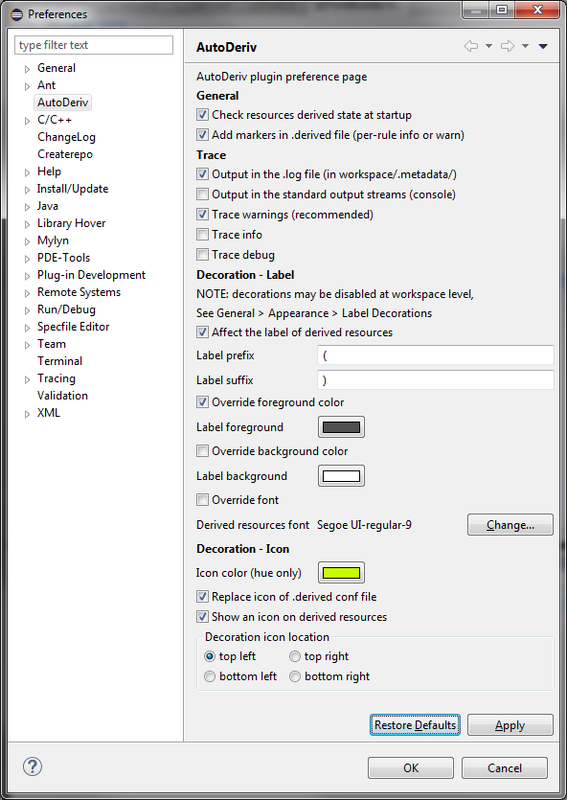 In order not to mess with the workspace, resources which are not subject to a rule have their derived flags manually managed (this is the default Eclipse behavior). Sometime, it is preferable to have a well determined default status for every resources. To achieve this, prepend a root rule to your .derived file. A root rule is just a rule that affects the whole project tree by targeting the root folder ( aka / ). This is really useful, every .derived file I wrote starts that way. # by doing this, all resources of the project are NOT derived by default. *.o        # object files are a product of compilation, set as derived. doc/*.html # html files from /doc/are generated. Not all project htmls. Note: the * matches sequence, the ? character matches exactly one character. You want a set of rules that is applied to the whole workspace? That is possible thanks to the master conf file. It is a standard .derived file that you put directly on the workspace root. All the rules written in that file will be considered for every projects, before the local rules. Since v1.3.0, the plugin uses the eclipse decoration system so that you can see instantly which resources are derived, which are not. This is very handy when you write .derived files as you can see the effects as soon as you save the modification. You may want to disable this in Eclipse preferences. Search for "decoration", or directly go to Windows > Preference > General > Appearance > Label Decorations From there, uncheck the AutoDeriv: decorate derived resources checkbox. This should disable decoration instantly. Since v1.4.0, AutoDeriv has its own Preference Page. Many aspects of the plugin are customizable so that you can choose the features you really want, with the design you like. Save the file in order that the update occurs, the whole project should now be clean. You can now delete the .derived file, and uninstall the plugin. Please let me know if something is wrong, if I can improve the plugin, I'll try my best. If something is wrong, or if you have an idea, a suggestion, you should open and fill an issue or even a pull requests. I'd be glad to add your name to the contributor list! If this plugin helped you, support it back with a donation! Many things can be improved!